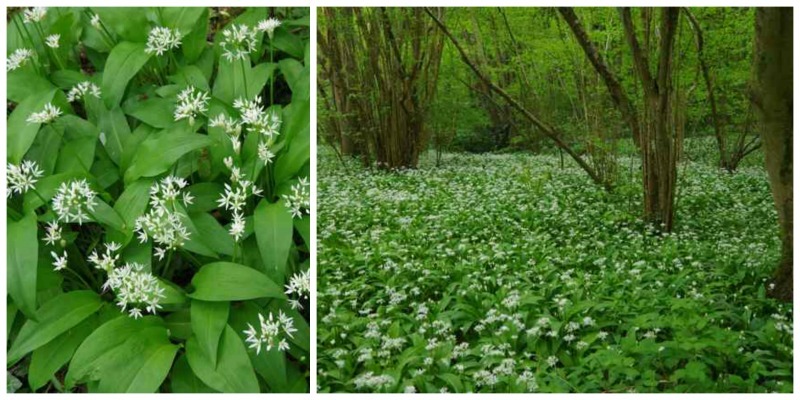 At the beginning of May as you drive past any damp native woodland you will most likely catch cool glimpses of wild garlic between the trees. The wild garlic comes hot on the heels of the delicate spectacle of wood anemones, rapidly superseded by the stunning colour wash from carpets of bluebells. 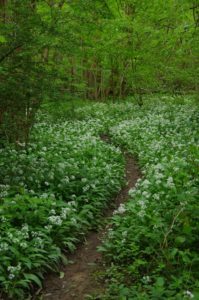 The wild garlic is now in flower and en masse it softens the light inside our native woods, lending them an almost greyish ethereal feel for a short while. The garlic flowers seem to flow over the curves of the land, mirroring its shape and following undulations perfectly as they dip down along the banks of tiny streams. It is as if a white sheet has been thrown out to cover the ground. 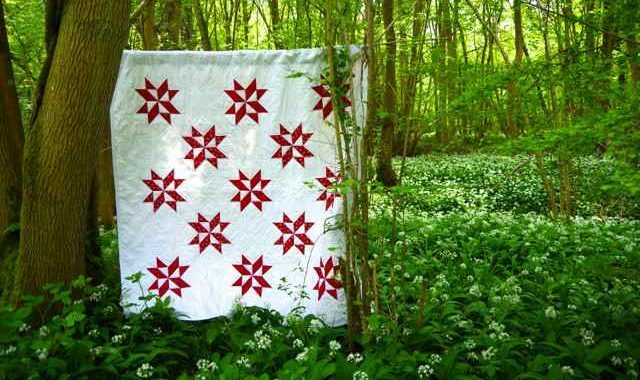 I absolutely love this time of year so decided to photograph the red and white quilt which I had made with the wild garlic as a back drop. 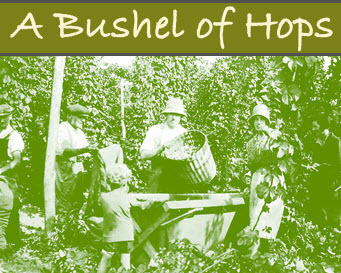 There will not be much time for sewing now that the growing season is here, that is more of a winter pleasure. Red and white quilts are a weakness and I have now made two with a third already planned. This one pictured is my second attempt, a simple star pattern but an easy quilt to use. The first one was more complex and a shared project with my daughter in Australia. We had swapped different red and white fabrics, but drew and stitched our own embroideries to decorate each white block. These embroideries were of something that was important to each of us, that we either liked or something which was significant in our lives. Of course we ended up with many of the same subjects but we each depicted them entirely differently. As Nova’s husband put it I did verbs and Nova did nouns! Whatever the end results, it was a special shared project which we both thoroughly enjoyed. It was the 4th quilt of these shared projects since her move to the other side of the world. 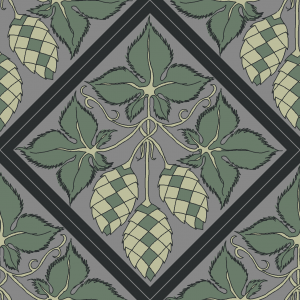 We are now doing a journal, so a much smaller project this time round, but one to get brains ticking and still with the fun of the ‘show and tell’. Talking of red and white quilts, there was an amazing exhibition 5 years ago at the America Folk Art Museum in New York. Mrs Rose was asked by her husband what she would like for her 80th birthday and he granted her wish which was to see her collection of these quilts all together in one place, it would be a first as she had 650 quilts in her collection! You have to love Mr Rose, bless him for his incredible generosity. The exhibition was arranged and his generosity extended to free admission to all comers for this event – not only a beautiful gift to Mrs Rose but an extraordinarily generous gift to New York and everyone who loves these quilts. I was not able to go but there is a UTube view of the Exhibition, for anyone who enjoys quilting, it is worth a look see. 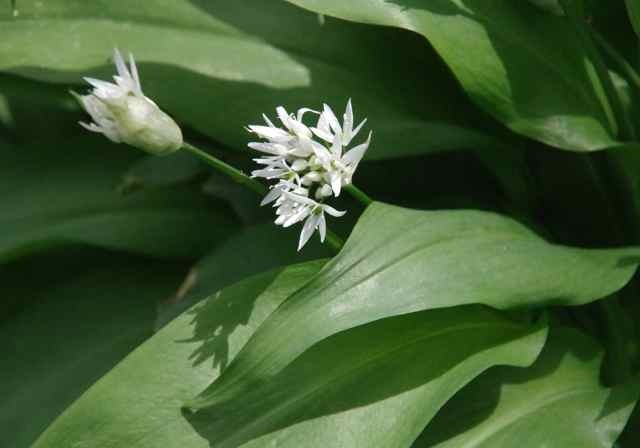 Adding wild garlic leaves or flowers to a salad is fun and this recipe is a seasonal treat – Wild Garlic Pesto. This must be with the caveat to only take a little, always forage with permission & respectfully, remembering that it is a treat. Take only a few leaves and leave the wood or river bank as if you have not been there, I have seen large areas completely cleared by professional foragers, horrible. We grew up being told we are not allowed to pick wild flowers so this still goes against everything we were taught.